And the heat is finally on. Happy month of April everyone and welcome to the hottest month of the year. This will for sure continue until May and then rain will start to fall by June. Oh my, just how fast the days go by. I can’t believe summer is already here. I am not a traveler. It was my eldest sister whom I admire the most when it comes to conquering cities. She had been to Boracay, Bacolod, Cebu and outside the country like Nepal and Malaysia. Whenever she have a new travel plan I am a silent supporter encouraging her. But as 2015 became nearer I also became obsessed with the idea of solo-travelling. I haven’t started yet for I do not know and how to but I am eager to take on 21 and more destinations before the year end. Since summer is here I thought it will be nice to incorporate some budget-friendly destinations that you might want to try. These is my magic list and what I’ll actually be investing in the days to come. I blog my travel in IzzaGlino so if you have time please follow my other blog too so that you’ll be updated in my whereabouts. Without further ado let’s begin. 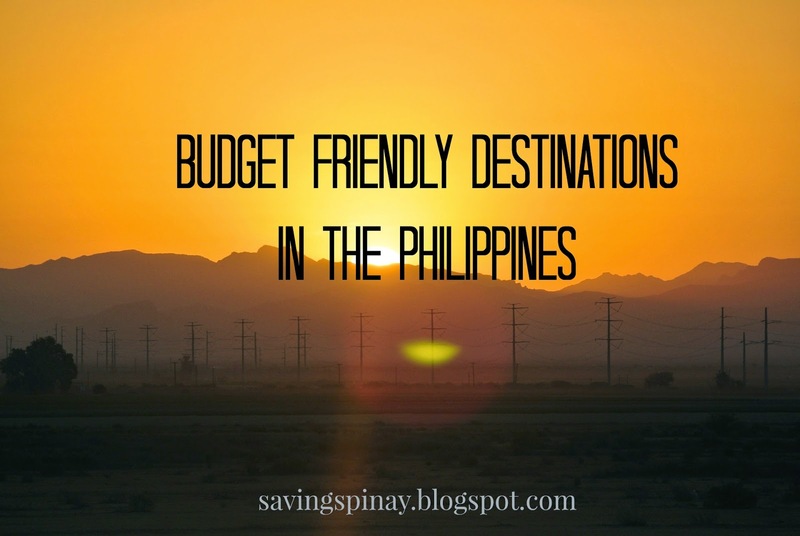 Here are my top budget-friendly destinations in the Philippines. This is just a classic place to spend a summer getaway. It is near Metro Manila and teh transpo fee is very friendly too. I came here solo for a wedding giv but I do plan to spend a good 2 days and 1 night soon. Tagaytay City, Cavite had been one of the best tourist spot ever. You’ll have the view of the famous Taal Volcano and have a taste of delicious delicacies like bulalo. How much should be your budget? Depending on where you are coming from and how long you’ll stay a good 750pesos/person/day trip will be enough. From LRT EDSA walk your way to the Savemore mall and there you’ll find jeepney going to Coastal. It is the terminal created by MMDA for buses going to the rest of Cavite, Tagaytay upto Nasugbu, Batangas. If you enjoy the beach then what a fun way for you and your wallet to spend an overnight in Laiya Aplaya, Batangas where a long stretch of find sand beaches awaits. It is famous for affordable accommodations and packages that includes karaoke, lodging and tours. This is a perfect destination for big families and barkadas. The fare may take upto 400pesos/head depending on the bus line you will ride on. Food, resort accommodation and other miscellaneous fees could have a budget of 900-1000pesos/head. Take a bus going to Lipa City on Cubao terminal or even Buendia terminal. The trip will last a good 1-2hours. Alight at San Juan and take a jeepney going to Laiya. Another famous area in Batangas for its Cape Santiago Lighthouse is Calatagan. It has a homey feeling and you will totally enjoy the cool provincial air away from the pollution of the city. A good 900-1000pesos/head for the fare, accommodation and food. You can ride a van in EDSA-Taft that goes straight to Calatagan. Just make sure you are ready for a mahaba-habang biyahe as the trip goes on for the next 3-4hours. I have been wanting to go here for the longest time but my fear has always stopped me. I guess a day trip here could really make a difference. If you don’t want that much of the beach but enjoy long walks while holding hands with your loved one then this destination is for you. How much should be you budget? Nuvali is located in the South. You can ride a bus going to Laguna and alight before the toll and/or go for an FX. Just last Saturday me and my family spent an overnight swimming for the first time in forever! It was such a great milestone for our family because the last time we were complete and on an excursion was like I’m still in high school. Out of all the five budget friendly destinations I listed, this Hot Spring and private resort strip in Pansol, Laguna has a special place in my heart. Though the water maybe hot and may not let go of your summer heat, you’ll still enjoy the adventure. The water is therapeutic and relaxing. I enjoyed that relaxation time that I experienced. Entrance Fee may range from 70pesos-150pesos depending on the resort you will go to and whether you are an adult or kid. You can also rent places (tables, benches) to stay from 500pesos to 3,000pesos. You can ride a bus in Alabang that says Sta. Cruz and tell the konduktor to stop you at the private resort you want to go to. 3. How to Make a Fresh Start in Life? 4. Introduction to New SavingsPinay Pages!!! 5. SavingsPinay’s SIX NEW FEATURES!! !